Nuvola Apps are web apps running in Nuvola Apps Runtime1 that provides them with more native user experience and richer desktop integration features than standard web browsers can offer. Nuvola specializes in music streaming services and offers background playback, handling of media key, integration with media player applets, Last.fm scrobbling, lyrics fetching, and much more. Nuvola supports the largest amount of music streaming services. For us, Linux is not a secondary platform but the system we love and use every day. We provide sandboxed Flatpak packages that can be installed on every modern distribution. The source code of Nuvola Runtime and individual Nuvola Apps are available on GitHub. 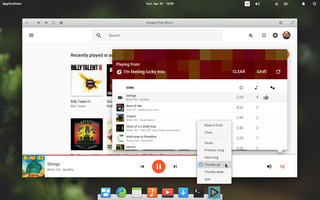 Although Nuvola should work in all Linux desktop environments, we currently test only GNOME (Ubuntu, Fedora), Unity (Ubuntu), and Pantheon (elementaryOS). We hope to explore other desktops in the future. You can follow Nuvola on Medium, Google+, Facebook, Twitter, Mastodon, or subscribe to the maling list to receive the latest news. Nuvola 4.16 was released. 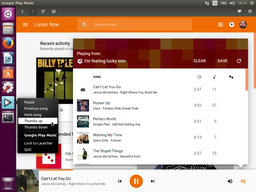 It reintroduces Libre.fm scrobbling, adds new service Ivoox, comes with updated Adwaita GTK theme and brings other bug fixes and improvements. Continue reading this article. Nuvola 4.15 was released. 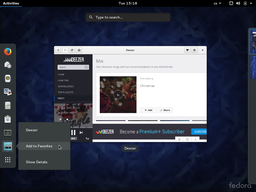 It brings the 28th streaming service (Jamendo), officially supports OpenSUSE, uses client-side window decorations by default (can be changed), fixes a few memory leaks and continues the quest to improve the quality of the entire codebase. Continue reading this article. Nuvola 4.14 was released. It brings two new services (Tidal and MentorFM), a few user-visible changes, upgrades the library stack (Chromium and GNOME Platform) and continues the quest to improve the quality of the entire codebase. Continue reading this article. Nuvola 4.13 was released. This announcement summarizes user-visible changes, which have been already announced separately, as well as important news for script maintainers and third-party packagers. Continue reading this article. The latest flatpak builds of Nuvola Apps integrate shuffle/repeat states, fix compatibility with the new Deezer design, and introduce Flash plugin updater for Amazon Cloud Player. In addition, the free tier bar was removed from the main window, the purchase flow was simplified, and the pricing has changed offering lifetime licenses as a one-time payment. Continue reading this article.